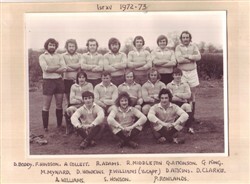 Olney RFC, black and white team line-up information, season 1972-73. Back row: D. Boddy, F. Hindson, A. Collett, R. Adams, R. Middleton, G. Atkinson, G. King. Middle row: M. Mynard, D. Howkins, F. Williams (Vice Capt. ), D. Atkins, D. Clarke. Front row: A. Williams, S. Howson, P. Rowlands.